After a year of thoughtful consideration , the race team at Duntov Motors ran its first Trans-Am race at Sebring, Florida, the scene of the very first Trans-Am race a half century ago. The Trans-Am series has four categories, but their TA2 group is their largest and it offers the most competitive and cost effective racing. The plan was to rent a car, run a few races to get firsthand experience, then look into becoming an approved TA2 constructor. Right now there are only two approved TA2 car constructors, although many race teams buy unfinished cars from one of these shops and complete the cars themselves. Duntov, being a General Motors licensed manufacturer of Corvette racecars, not only builds their own racecars, they have built many of the leading Chevys in SVRA Group 6 vintage racing. With the scheduling of Trans-Am and SVRA vintage events together on more and more race weekends, it seems like a natural move for Duntov to participate as both a manufacturer and a competitor in both series. 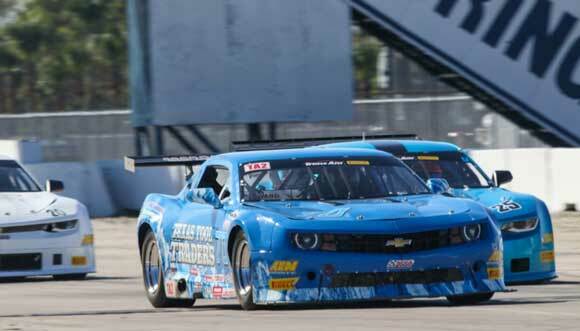 The first phase of this move into Trans-Am was the season opener at Sebring. Duntov rented a three-year old Camaro that hadn't raced since 2015. Although the series was designed to minimize annual obsolescence, there has been leap years of development in these cars since 2015, and the Duntov team knew that they would likely be running uncharacteristically somewhere in the middle of the pack. In the past couple of years, several SVRA Group 6 regulars have tried their hand at TA2, with rented cars and middle of the pack results, so there was no expectation of a podium finish this weekend. As it turned out, expectations and outcome were very similar. Out of field of 32, Edward started 10th, just behind Peter Klutt in 9th and Curt Vogt in 11th, so ninth through eleventh was made up of SVRA Group 6 regulars. Both Klutt and Vogt were in new cars, so Duntov was pretty pleased to start tenth. In the race, Klutt spun on the first lap and Edward was running comfortably in the top ten when, six laps from the end, he was taken out by John Atwell's over aggressive move in the hairpin. The damage to Atwell’s car was superficial, so he was able to continue. He got a drive through penalty, but Edward's race was done.